I got off the phone with a salesperson this morning, and it wasn’t the most pleasant experience. She was very nice until she realized she was losing the sale. I had called to book a hotel room. Afterwards, I was transferred to their promotions department to find out about a really sweet deal on a 3-night hotel stay. It was actually a great deal. And they were even offering a $100 rebate if you attended a 2-hour tour of all the cool new things this particular hotel chain is doing. Even without the rebate it was a good deal, so I was ready to move forward. She said the only way she could make that work was to increase the rebate amount to $200. I told her that with a 4-year-old boy and twin 1-year-old girls, there’s no way we would want to drag them through a 2-hour tour. It just wouldn’t make sense. She told me it was very kid-friendly, that they have daycare available, etc. I told her we just weren’t interested. If the tour was mandatory, it wasn’t a good deal for us. She got a bit huffy and quickly got me off the phone. I’ve been a salesperson all of my adult life. I know that there are times when you can overcome objections, but as soon as you try to force the wrong solution on someone, it gets ugly. It’s either a good fit or it’s not. If it’s honestly not a good fit, don’t force it. What’s all this have to do with home recording? I don’t know…but it made me think of Dueling Mixes. We’ve recently revamped the members area and updated the main page to give you a better idea of what it’s like to be a DM member. While I do talk a lot about Dueling Mixes (and my other paid tutorials), I never want to shove them down your throat. If you never buy a thing from me, that’s completely cool. I hope these daily emails, my weekly podcasts, and the hundreds of free videos I’ve posted will be an immense blessing to you. 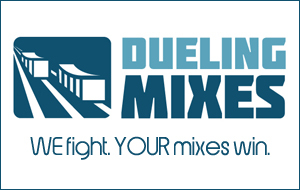 But if you DO want to dive deeper, get better, and have two mentors to walk along with you, then Dueling Mixes exists for you. Heck, we’ll even refund your money if you decide it’s not for you. But we deeply believe in what we’re doing over there, and it’s helping hundreds of people just like you. They’re getting mixes they never thought they could possibly get on their own. Read the new member testimonials we posted over there. See if it’s a good fit. If it is, we’ve got a great new song for you to mix. Come join us!